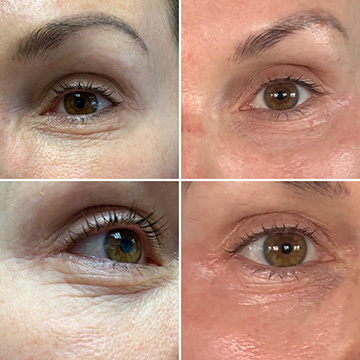 Our latest innovative procedure, the Plasma Pen is a revolutionary new way to brighten the skin while improving the appearance of lines, wrinkles, and skin sagging. Rejuvenate virtually any area of your skin with the non-surgical Plasma Pen procedure and experience long lasting results. While most skin tightening and rejuvenation devices use needling (microneedling), radiofrequency energy (Thermage), or lasers (Fraxel), the Plasma Pen utilizes electrostatic energy delivered through a small tipped applicator. These energy impulses discharge precise flashes of plasma in milisecond bursts, triggering the body’s natural healing and anti-aging processes in the epidermal and dermal layers. Yes, your own body does the rest, growing new collagen and elastin to improve skin tone and texture. Ultra Smooth Skin is a nationally recognized aesthetics practice by innovators in the field of medical aesthetics. Our expertly trained, medically-licensed aesthetic providers consistently deliver high-quality care and beautiful results in three convenient valley locations. Combined, our team has decades of experience in facial anti-aging coupled with an expert understanding of facial anatomy and skin care. During your initial consultation, one of our providers will evaluate your skin and discuss to your rejuvenation goals and expectations. We will take a full medical history to ensure you’re a good candidate for the Plasma Pen treatment. If we determine that Plasma Pen is a good solution for your needs, we will proceed with treatment; if not, we will discuss other options for facial rejuvenation and anti-aging available in our Phoenix-area medical spa. Treatment begins with the application of a topical numbing cream. Your procedure time will vary depending on the size of your treatment area, with treatment times ranging from 30-120 minutes. Once we have finished the Plasma Pen procedure, we will apply a topical aftercare cream to the treatment area. This aids in post-treatment healing. Plasma Pen results are virtually immediate and last about three years. For a few days following your treatment, you will experience some skin flaking, as Plasma Pen triggers skin cell turnover. This peeling helps reveal fresh, youthful skin. For the next several weeks and even months, collagen production gradually increases. This improves youthful plumpness, giving your skin the support structure it needs to lift and tighten. Patients can expect to see full results after six months of natural collagen building following a single Plasma Pen treatment. The Plasma Pen is a relatively new device, so you will naturally have a lot of questions. We recommend contacting us to discuss this procedure and schedule a consultation, as that will allow one of our providers to discuss details specific to your skin needs and goals. In the meantime, read through these frequently asked questions and answers about the new Plasma Pen in Scottsdale and Chandler, AZ. Why should I choose Ultra Smooth Skin for Plasma Pen treatment? What areas can be treated with Plasma Pen? Where will my Plasma Pen treatment be performed? Does the Plasma Pen treatment hurt? Is there any downtime? What should I expect following my treatment? How much does Plasma Pen cost? Plasma Pen delivers results without surgery or injectables. It requires no sutures, scalpels, or injectable anesthetic. It is also non-ablative and chemical-free. Our Plasma Pen is a CE Certified device using a safe technique that is well-established in the industry. Plasma Pen is considered a low-risk procedure with a rapid recovery and minimal side-effects. Why should I choose Ultra Smooth Skin for a Plasma Pen Treatment? Ultra Smooth Skin founder Lisa Williams, ANP-C is a facial anti-aging expert provider and trainer, offering patients with a variety of natural-looking facial skin care and rejuvenation procedures. Lisa and our team of licensed aesthetic providers administer proven treatments for skin rejuvenation, anti-aging, and body contouring, including Thermage and Fraxel, and injectables like Botox, Juvederm, and Restylane. Ultra Smooth Skin is located in three convenient locations, with offices in Scottsdale, North Scottsdale, and Chandler, AZ. To provide our beautiful patients with even more options, we now also offer the revolutionary new Plasma Pen procedure. The Plasma Pen is typically used on the face and neck, primarily around the eyes. However, it can be used on the hands and even the elbows! If you have skin that is loose, wrinkled, or sagging, Plasma Pen may be the solution for you. If not, we have numerous options to help provide you with the youthful look you desire. Plasma pen is non-surgical; therefore, we can perform it right here in our licensed aesthetics practices in the Phoenix-area. You will find us inside of three Village Clubs locations in Scottsdale and Chandler, AZ: Gainey, DC Ranch, and Ocotillo Village Health Clubs. Patients reported little-to-no discomfort during treatment. A topical numbing cream is recommended before treatment to ensure your comfort during the procedure. Following the treatment, your skin may continue to feel slightly numb. This is normal. Skin sensitivity is normal for about three days following treatment. You will be able to return to your normal routine immediately. For two to three days, you may experience some skin sensitivity, mild redness, skin crusting, and flaking. Recovery is very fast and results begin to emerge almost immediately. Fresh skin will appear underneath the treatment area as the unhealthy skin cells fall away. And for the next several weeks and months, your skin will become tighter and more youthful. Pricing varies depending on your treatment area. As results last up to three years, this procedure is considered very cost-effective. Scroll down to view pricing and exclusive offers available at Ultra Smooth Skin. The Plasma Pen treatment is the latest and greatest, non-surgical method to revitalize your face and body.